Druzy is a stone I've been seeing a lot of places lately and I know QVC especially seems to do a lot with it. Well if you love druzy and want a lovely piece without breaking the bank, try this Celestial Ring from Ali's Collection. This was my first druzy piece and the stone was far prettier and had more sparkle in person that I expected. It looks bold on the hand and makes a statement. 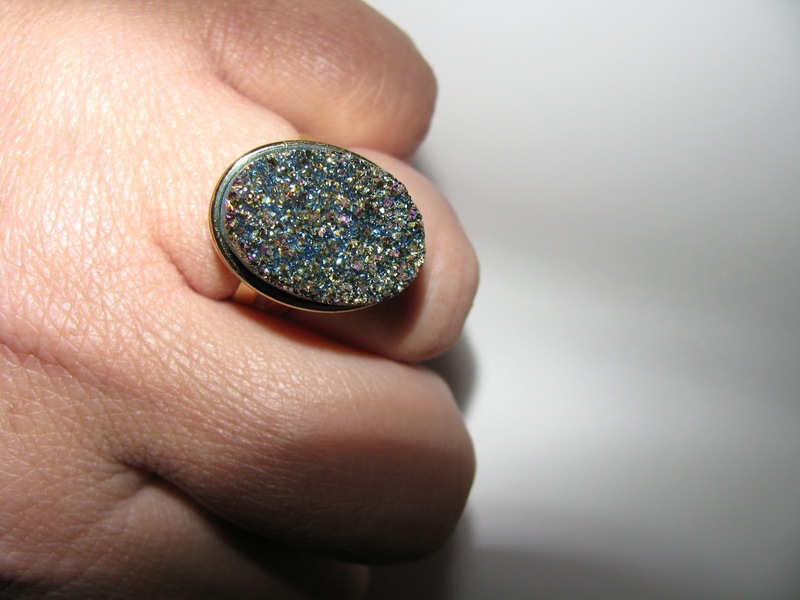 It's rainbow druzy in a gold plated setting and is adjustable. The pictures really don't do it justice. Ali's Collection is a line of handmade pieces from Alicia Mohr , a Chicago based jewelry designer who uses mostly natural stones and loves bright color. Her pieces are organic and easy to wear . She first came on my radar last year with her big and beautiful Agate Cuff . 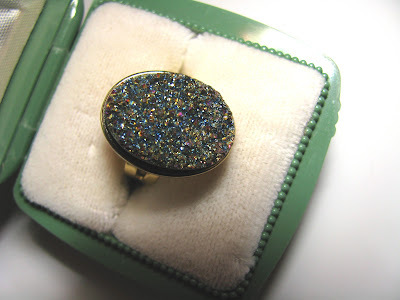 Celestial Druzy Ring measures about 3/4" long by 1/2" wide and is $ 40. I said in summer when I tried the then new releases for the season how amazing Softsoap's scents are. I've almost finished Tropical Twist and I'll miss it. It smelled so good. 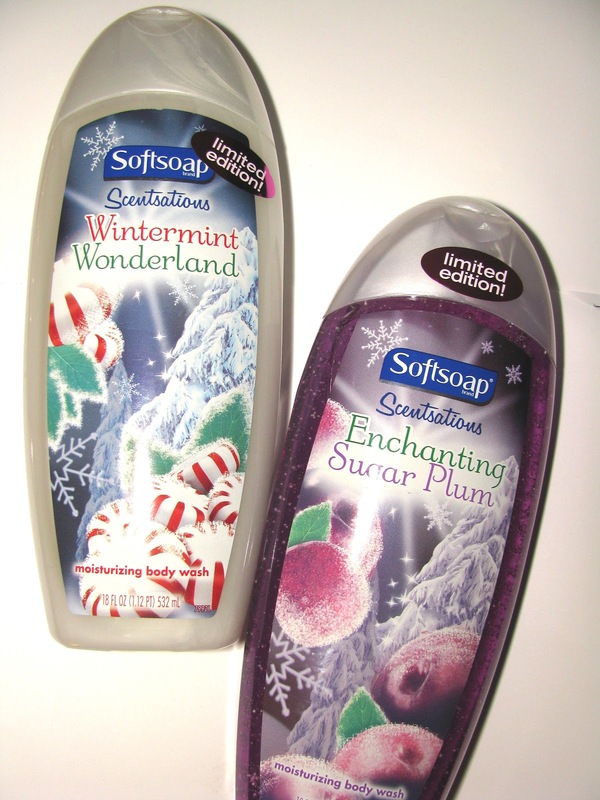 But winter brings new and wonderful scents like Wintermint Wonderland and Enchanting Sugar Plum. Both of these smell delicious and are LE just like the summer ones were. I have to say , too, that I love the festive labels that give that bathroom a little cheer . Wintermint Wonderland is a creamy wash that is super peppermint-y with a little vanilla. If this doesn't wake you, nothing will. 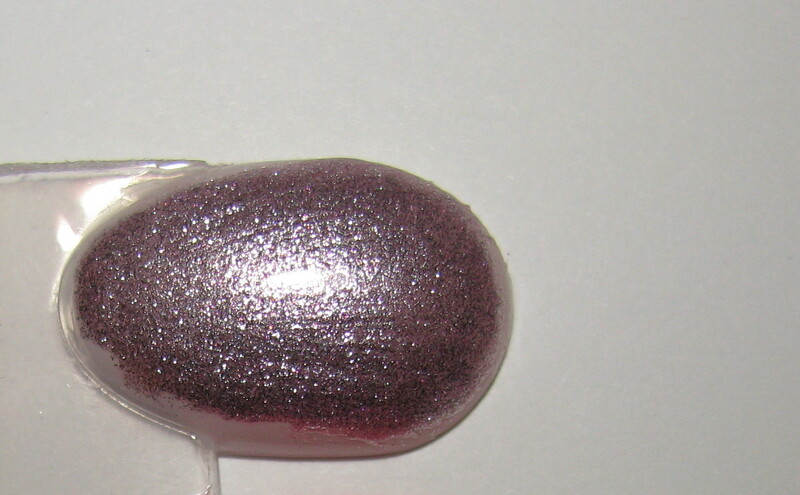 Sugar Plum is a gel with moisture beads and smells like a sweet berry blend . Nutcracker Suite all the way. Both are available only at Wal Mart now through the end of December and are $ 3.48 each . I also noted , gladly, when reading the bottle- made in USA. You have to check everything these days even shower gel. I've been using Colgate Optic White toothpaste for a couple months now and have really seen an improvement. Subtle but definitely there. To help the whitening go farther there is Colgate Optic White Mouthwash which I just started using. 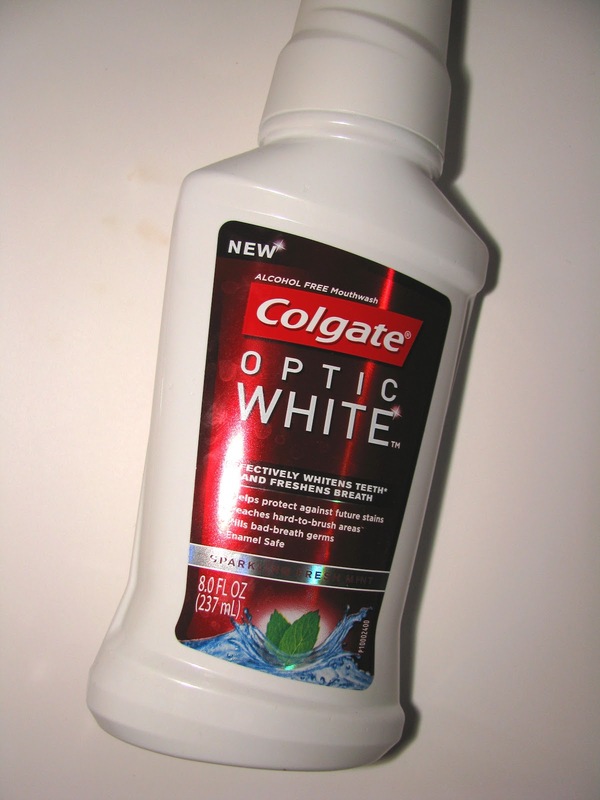 Optic White Mouthwash is supposed to more than freshen breath but help whiten teeth even more. I use it after brushing with Optic White Toothpaste. It has a tingly feel but not too strong and unlike many mouthwashes , it tastes pretty good. It's sweet and minty of course but maybe there's a hint of vanilla in there? Use it twice a day for 60 seconds to help get those pearly whites even whiter. You can find a whole Optic White line including a toothbrush and automatic toothbrush as well. Fun and (semi) practical are two things that don't always go together . 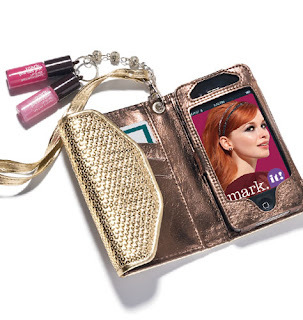 In this adorable Talk Is Chic phone case with lipgloss from mark. they do in spades. 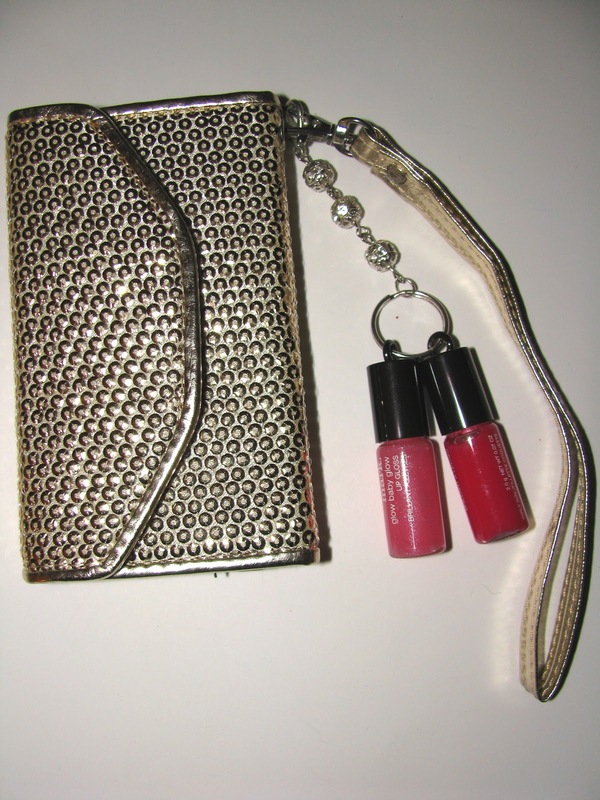 You get a gold metallic sequin, medium size, wallet case that holds an iPhone on one side ( other phones might fit, but I can't say for sure) , several credit card slots with one pocket slot under them and 2 mini Glow Baby Glow lipgloss charms in Girly Girl and Sweet Talk. 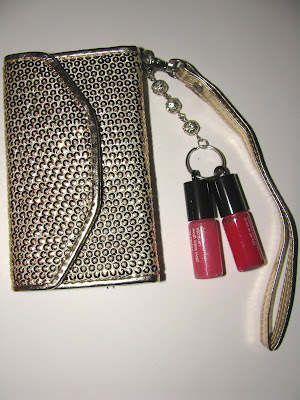 The lipgloss charm is removable as is the strap . 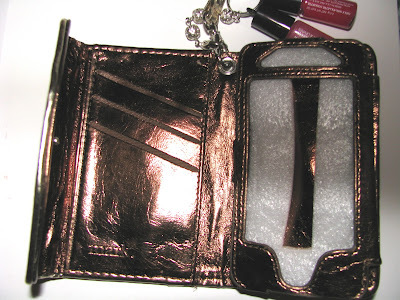 The case itself is 4¾" W x 2¾" H. Just enough to hold evening essentials- money, lipcolor and a phone. It is also small enough to fit into another bag if you want . I love this. 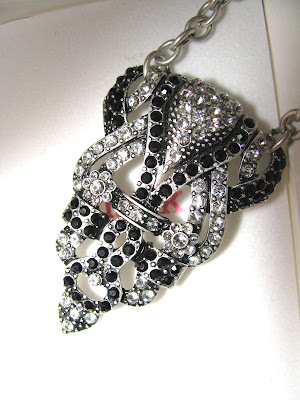 It speaks to the magpie in me and I have a feeling I will add the charm to other bags and keychains as I love keychain lippies and have beaten up pretty good the ones I have. It's fun and as with many items from mark. would make a great gift . Talk Is Chic Phone Case $ 16. 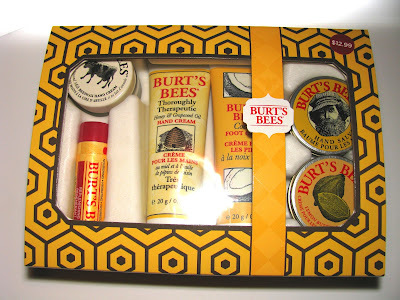 Gift wise I always think the sets from Burt's Bees are among the tops. Why? Because they have something everyone can use ( hand cream, body lotion, lip balm) , they are priced very right and are easy to find at Target, Walgreens etc. I always think of these when I hear people saying how hard it is to find gifts, they hate shopping etc, etc. These are gift giving made easy. This year there is a nice assortment of gift sets ranging from a simple lip balm/cuticle balm combo at $ 4.99 to the largest set with Pomegranate at $ 19.99 . In between we have these two highly useful sets - Tips and Toes and Essential Burt's Bees. 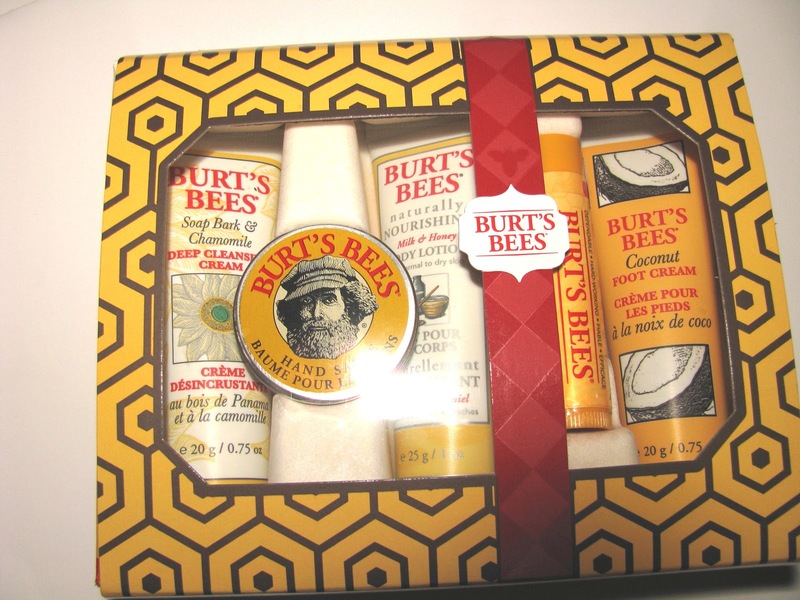 Tip and Toes ( $ 12.99) has Almond Beeswax Hand Cream. Thoroughly Therapeautic Honey & Grapeseed Oil Hand Cream, Coconut Foot Cream, Lemon Butter Cuticle Cream and Hand Salve. 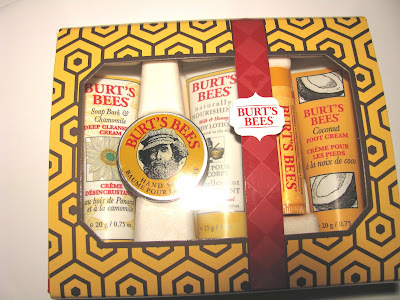 Essential Burt's Bees ( $ 9.99) has Soap Bark & Chamomile Deep Cleansing Cream ,Thoroughly Therapeutic Honey & Grapeseed Oil Hand Cream , Hand Salve, Fabulously Fresh Body Wash, Coconut Foot Cream and Lip Balm . How pretty is this Art Deco inspired necklace from mark? It's been forever since I had a piece of jewelry from Avon , never from mark. and I'm impressed. Not that I'm a jewelry snob, I'm not. I have the finest gems to ten dollar handmade beads from a craft show. But this really caught my eye and in person it was just as nice. This has weight to it, it's not heavy but it's not featherlight metal either. 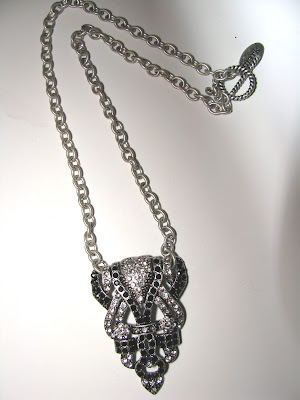 I like , too, that the main piece is very retro but the chain is modern. It's a fun juxtaposition that makes it seem less precious . It also makes me think of Downton Abbey, even though the era is not the same. If you want to capture some of that vintage look , this will do it. It's fun for holiday party looks and as a gift, and will only set you back $ 26. Hit The Deco measures 18 1/2 " and the pendant measures 2 1/4" long. Find it at www.meetmark.com or through an Avon/mark rep.
MAC has 4 nail polishes for holiday in the Glamour Daze collection. My two favorites ? Girl Trouble , a metallic , glittery, silver tinged lavender ( MAC calls it glitter pink) and Everything That Glitters, a high glitter , multi colored, over a black base. 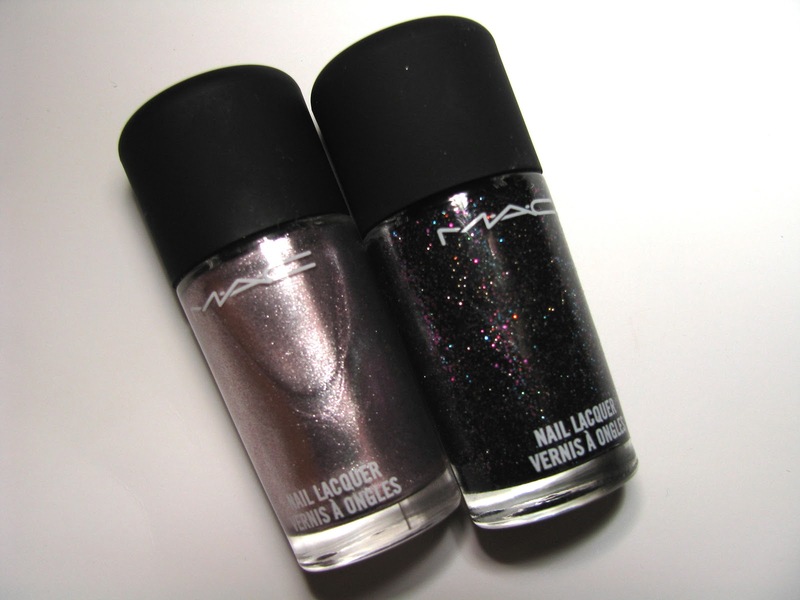 The glitter is so very holiday looking in both but the cool tones of Girl Trouble, I think, make it almost season-less . Girl Trouble feels smooth on the nail and needs 2-3 coats for full coverage, 3 being best. Everything That Glitters has a rough glitter feel and needs 2 coats. MAC Glamour Daze is on sale now and these are $ 17.50 each. 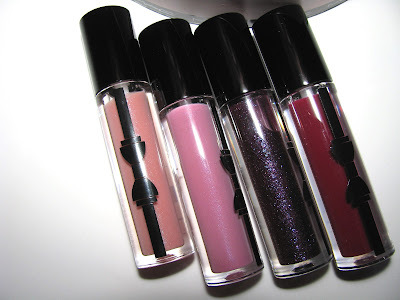 Guilty Passions is the MAC holiday collection in hatboxes. I love a good hatbox, and have a collection so I think these are so cute. 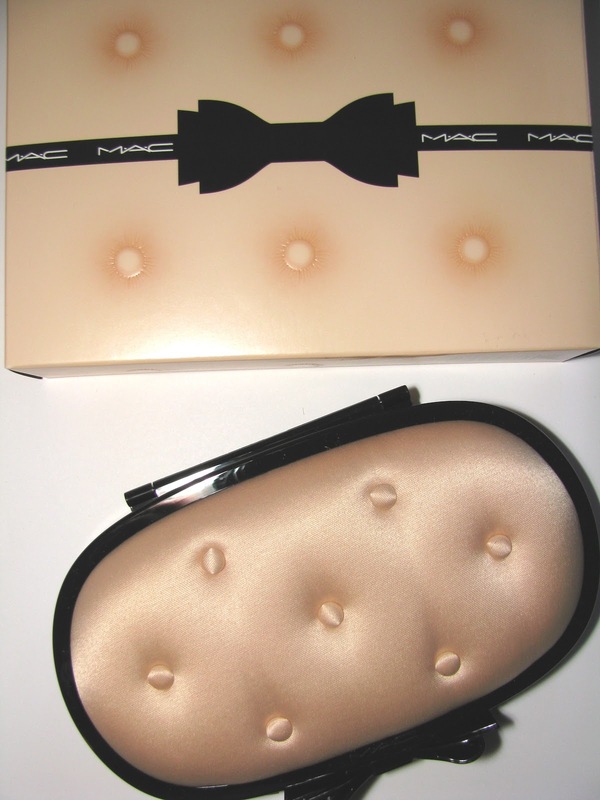 They also have a cute patent leather bow on the box lid. The Lavish Rose set includes 4 glosses in Demure ( Dazzleglass Creme), Going Casual (Cremesheen) , Boys Go Crazy ( Dazzleglass Creme) and Colour Saturation ( Cremesheen). It's a pretty group of rose and purples. MAC holiday has arrived and it's looking oh so pretty. This is Gorgeous Bronze, Face Kit from All For Glamour. The outside is a satin like tufted fabric that's very retro chic. When you open it you have Golden Bronzing Powder, 3 eyeshadows- Hearts a Flutter, Romance Me and Shadowy Lady as well as 2 lipsticks ( under their own black lidded hatch) in Barely Lit and Headturner. A large mirror is on the inside and a small dual end brush rounds it out. The whole kit measures about 5 1/2 inches long x 3 1/2 wide. It's a nice size but fits in the palm of your hand easily just as a minaudiere would. I'm loving the colors here. The shadows are pink to plum .The deepest shadow is a dark plum and the middle one is medium plum . Barely Lit has always been one of my favorite lipcolors . Look for the All For Glamour line to hit stores tomorrow. Retail is $ 49.50 and it's online now. At last we've seen images of the Narciso for Kohl's collection. There was a quite the launch party in NY last night and both Julianna Margulies and Emma Roberts wore dresses from the collection and images of the rest of the collection have also turned up. It all looks very Narciso and quite pretty. I am loving seeing dresses with sleeves. What I want to see in person is the fabric content. There's way too much polyester flying around these days and I hope these aren't all poly blends. Price for the dress Julianna wears is $ 64 . Look for it in stores Nov. 7. Now that I have longer hair I look for fun new hair accessories. 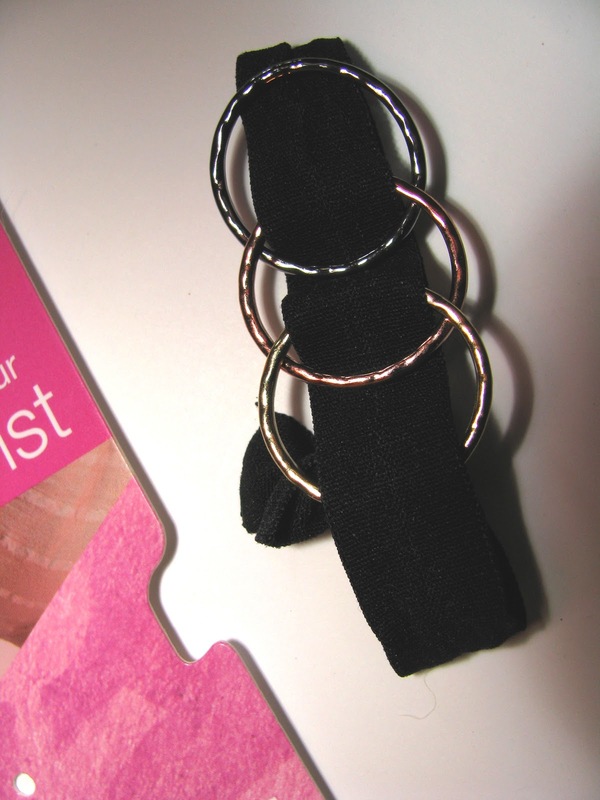 Ponytail holders can be boring but no basic elastics here with the new Scunci Ponytailer Bracelet. 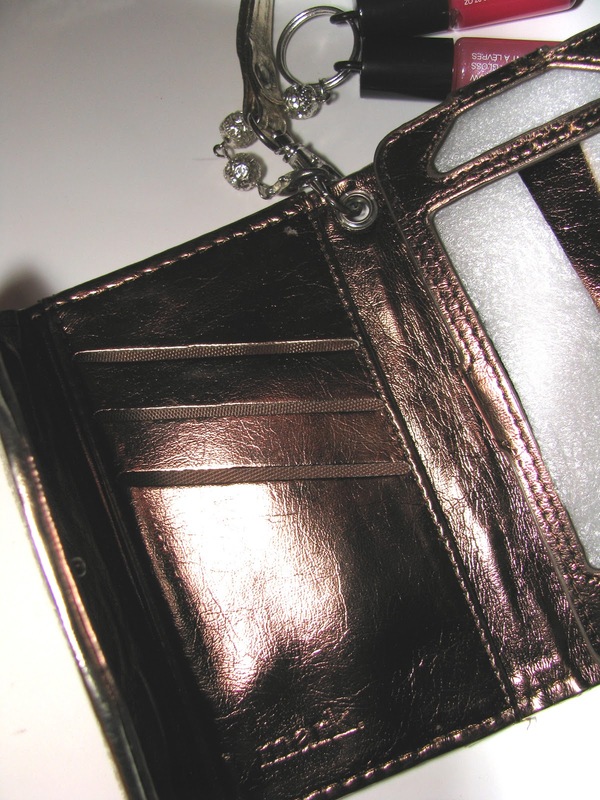 These pony holders have little details like beads or metal accents to take them beyond boring . 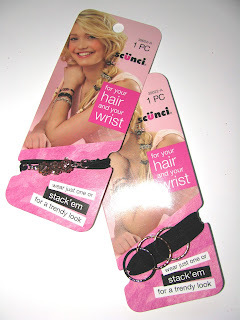 And if you're one of those people who always keeps an elastic around their wrist for just in case hair moments ? Well these look much better than those plain ones we all have so many of. That's where the bracelet name comes in. While there might not quite make a "bracelet" on their own, as a wrist accessory that doubles as a hair one, or vice versa, it's pretty good. Ponytailer Bracelets are $ 3.99 and available at Wal Mart and CVS in nine color/styles. One more new holiday 3 in 1 from philosophy- To Believe just hit Sephora . This one is a charity benefit for WhyHunger. 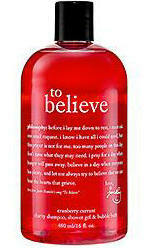 To Believe is Cranberry and Currant scented ( sounds very yummy) and is $ 20 . It will be on sale through January 2013 at philosophy.com, Sephora and Sephora at JCPenney Stores. philosophy has partnered with WhyHunger , who makes ending hunger their mission and singer Jackie Evancho, whose song lyrics adorn the To Believe bottle. Also, with purchase, you get a free download from Jackie Evancho. 100% of philosophy’s net proceeds from the sales of To Believe will benefit WhyHunger. Bobbi Brown is the latest to bring out a BB Cream. It launched in August and has quickly become one of my favorites . 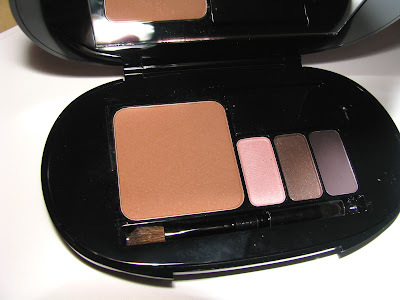 Bobbi's BB has good coverage and can easily be used by itself for a lighter makeup look. 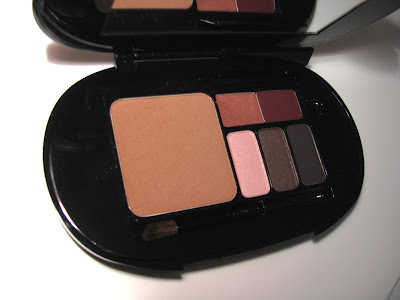 I'm impressed by the coverage and how it goes on a little moist, but then settles into a very smooth , perfected look . 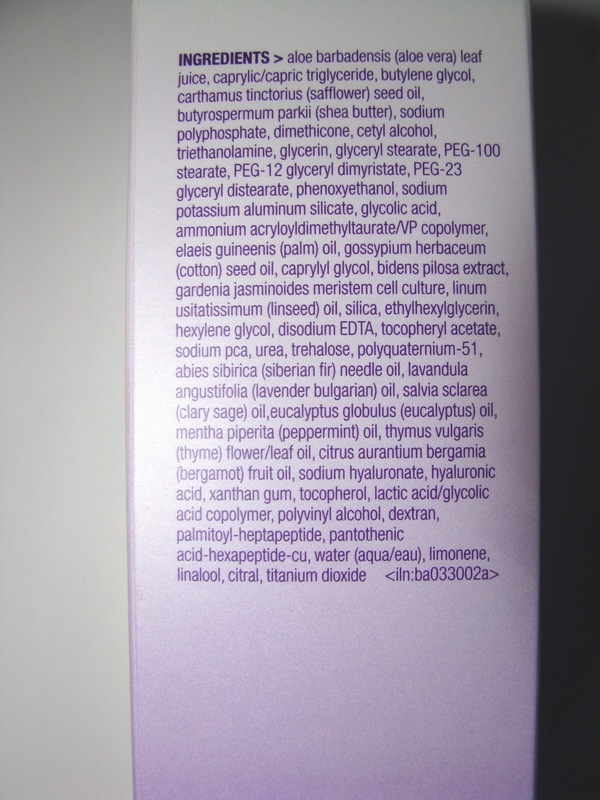 Like many of the better BBs this contains good for skin ingredients like Scutellaria Extract for dark spot reduction , peptides for collagen boosting , caffeine and vitamin E and SPF of 35. There are 5 shades ranging from Extra Light to Medium Dark . Shown are Light at top, and Fair . They both look a a bit darker in the image than they are. I am pale and Light is perfect for me. 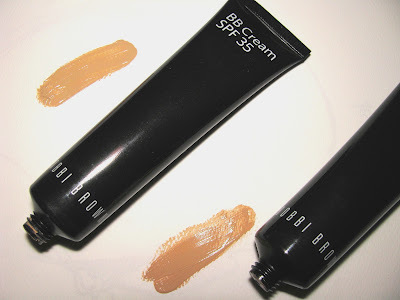 I rate Bobbi Brown BB Cream among the top of the BB crop and if you are looking for a great BB , this is one to consider. I think it could be used by all but possibly the very oiliest skins, but test a sample first if you are extra oily to make sure. $ 42 at all Bobbi Brown counters. 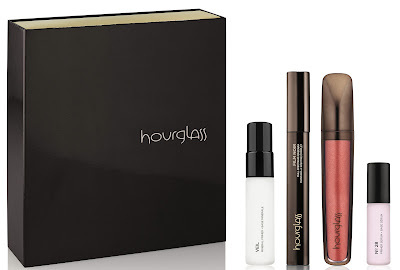 Hourglass makes some fab products and this new for holiday gift set gives 4 of them in one box. If you haven't tried Hourglass, this is a nice way to acquainted , and if you have , this is a try more/stock up set . The set includes a full-size Film Noir Mascara; full-size Extreme Sheen Lip Gloss in Ignite; travel-size Veil Mineral Primer; and deluxe sample size No. 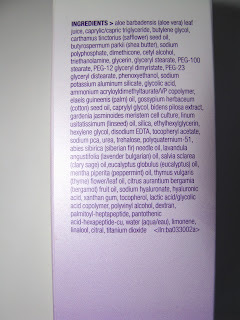 28 Primer Serum . Bliss latest skincare powerhouse is Firm, Baby, Firm which as you may guess is meant to firm up your skin. Bliss has 5 patented technologies they use here along with gardenia phyto stem cells for elasticity and collagen and peptides. 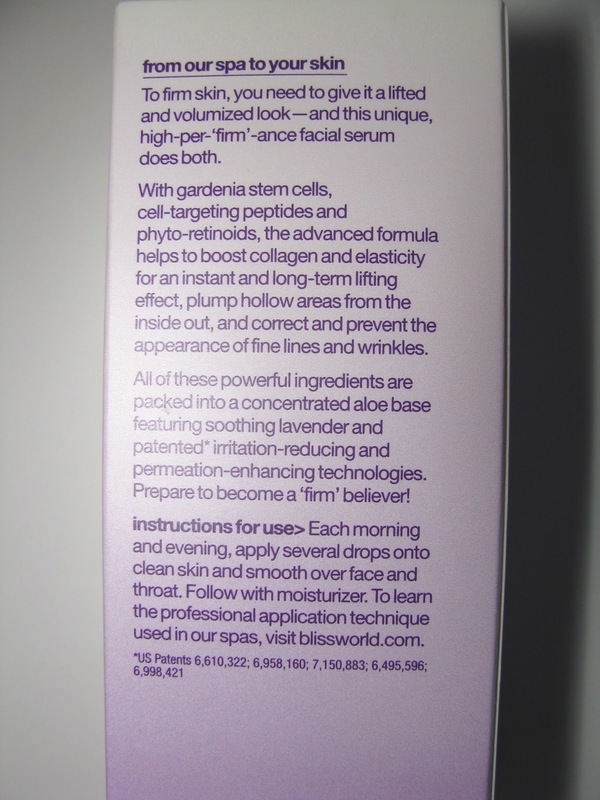 What's interesting here is that this is pretty moisturizing for a serum. Not all serums are moisturizing, which is a good thing as far as I am concerned, but if you want the power that a serum usually packs with a bit more moisture than usual, then this might be the one for you. It has safflower seed oil and shea butter, highly unsual for a serum and the base is aloe vera which is light but great for skin. There are also a lot of essential oils listed including lavender, eucalyptus, clary sage , peppermint , thyme and bergamot . Firm, Baby, Firm has a nice feel on skin. a little thicker than many serums but still lighter than a cream. 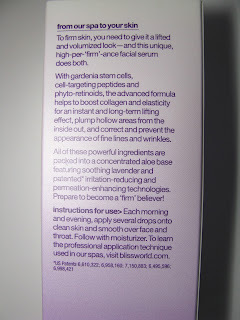 That makes it easy to use on it's own or to layer under another moisturizer. You feel a little firming action as it sinks in, but the best results will of course be had over long use. 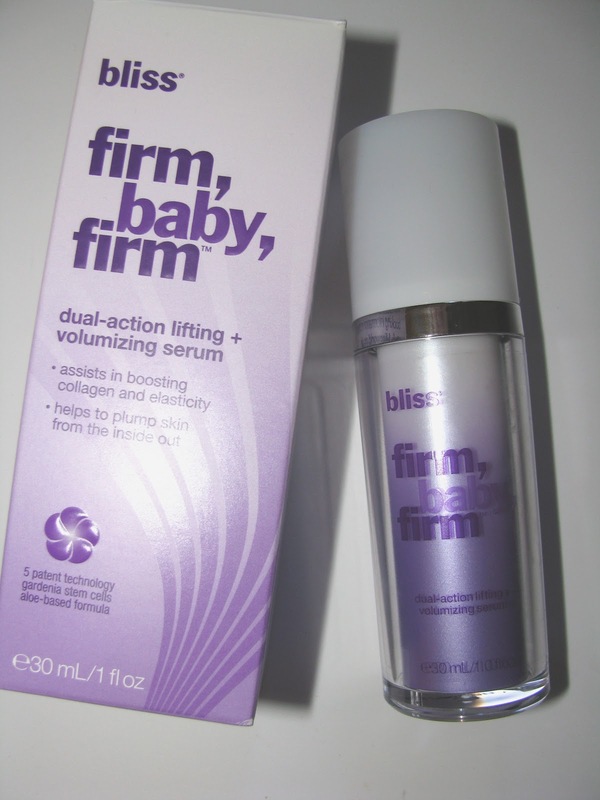 If you want to Firm, Baby, Firm check it out wherever Bliss is sold for $ 75 for a 1 oz bottle. I've always loved The Body Shop's Cranberry seasonal holiday scent. I've posted on it since the first year of my blog in 2007 and bought it before then. It's my favorite holiday scent and that's saying something since I try so many and love quite a few. Each year they bring it back, meaning I'm not the only one who loves it , and this year is no exception. The usual products are here- shower gel, body butter, soap , hand lotion. There is also bath salts, shown, a huge tub of them to be exact. These are strong enough to act as a room scent while I type. I really love the hand lotion bottle. It looks like an ornament. Perfect and festive for the season and a great gift. You can always use more hand lotion . Mix this with a couple other products and have a gift to make them smile and smell good. If I recall correctly, The Body Shop will package up your picks for you right at the store. ( They used to, so ask if they still do). Of course there are always pre-made gift sets as well which aren't on site yet. 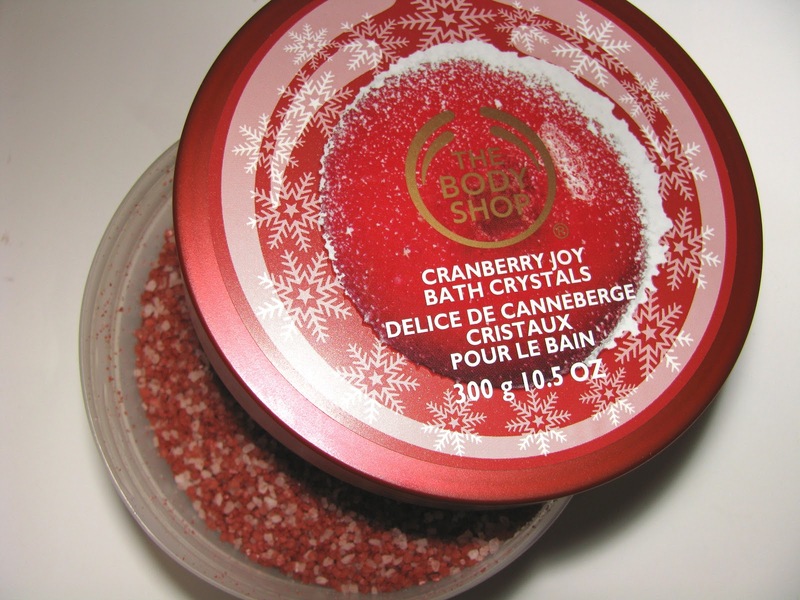 Ginger Sparkle is a new scent for holiday from The Body Shop. Now , in my opinion, The Body Shop has always done some of the very best holiday scents. 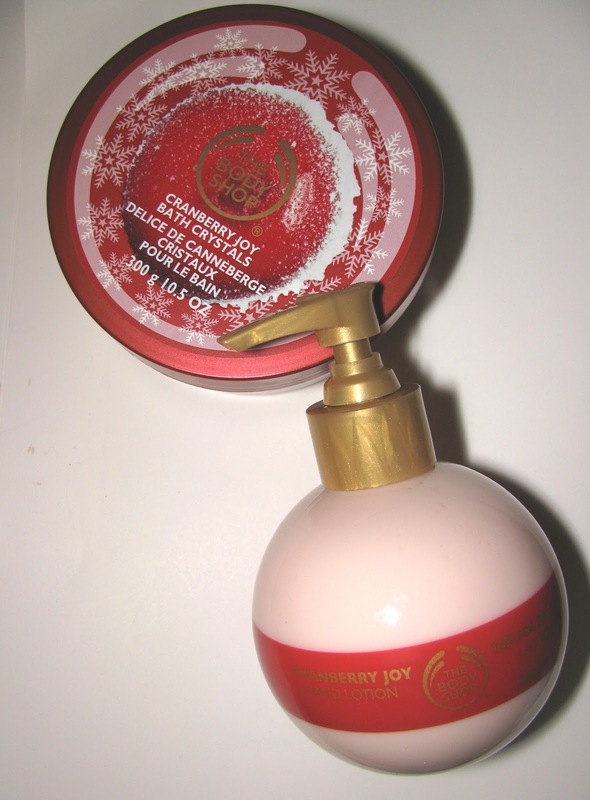 I still want their Cranberry Joy every year , it being a very top favorite of mine since it was first released. But more on Cranberry Joy in a separate post. 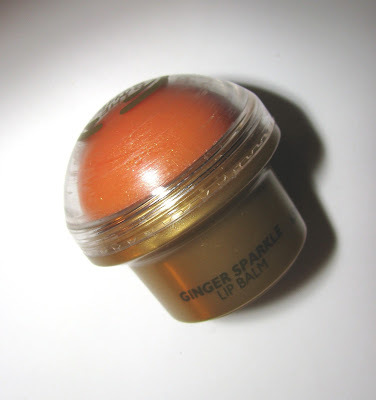 We're talk zippy Ginger Sparkle here and it smells truly delish. Very ginger ale like but warmer and with more spice. Ginger root oil and extract are in there. I think it's pretty much the same scent new name, as last year's wonderful Candied Ginger. I show the Body Polish And Lip Balm here. There are also the usual products -rich Body Butter, Shower Gel, Soap and more in all the holiday scents. The Body Polish, if you haven't tried it , it's not too coarse using walnut shell powder for an exfoliant . It can be used as a shower gel almost , yes it scrubs, but not harshly and has oils for moisture. The Lip Balm is a dome style like EOS and has that same great ginger scent, but not as strong as they body products. Most would think that good, I would have loved a bigger ginger punch but that's me. The Body Shop's lip balms are always good, giving plenty of moisture . There are some sparkle pieces in this, not tons but they are there. You can find most of the new holiday line online at www.thebodyshop-usa.com and in stores. You know what they say, Mother Knows Best. They're right, you know. This case in point involves hair, an area where The Mom is an expert. One thing I really hadn't ever had much trouble with hair wise was my hair falling out and /or breakage. Now that it's long again that changed and I've been shedding more than the dog. 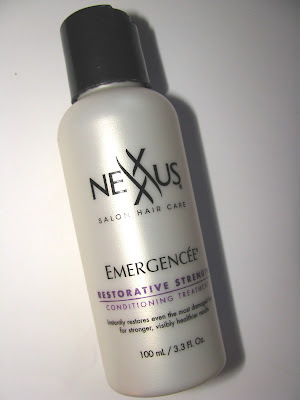 It was driving me crazy and mom noting hair in the kitchen that I left behind, said you need Emergencee. Emergencee is a product that she's used for decades. Mom knows breakage and hair coming out. She uses this to keep her hair strong and more of it on her head. So off I went with the small bottle and instructions to use it after shampooing, leave on 5 minutes minimum and then shampoo again and condition. Done. My hair was more volumized and lo and behold it just hit me yesterday, that I hardly have seen any hair in the sink the past few days. Emergencee is a long term leave in and you only use it every 2 weeks . Nexxus calls it a Strengthening Polymeric Reconstructor and it contains a blend of Polymers, Elastins, Amino Acids and Collagen. If you're prone to breakage or hair falling all over the place you'll hardly find better to fix it up. Mom's the word. It's no secret I love Kushyfoot products. Their hosiery is my mainstay any time I have to do a lot of walking . They also have other products like Flats to Go and new this season for winter are leopard fleece ones. Fun, aren't they ? They have soft ,warm fleece and the massaging sole for comfort. Flats to Go are great to tuck away in a bag for travel . When you need something to pad around the hotel room or In- Law's house, these look better than socks but still are comfy. Also new are slipper socks. Again they have they massaging bottom on a ballet flat looking, thin sock. The cotton/poly/spandex blend is cozy comfort on a cool night. Look for sales, especially at Rite Aid, who often have BOGO on the whole line. There are so many highlights to MAC's holiday collection and I am sure you've seen a lot of the images popping up everywhere today. One of the ideas I love most is the Divine Desire mini collection within the larger Fabulousness line. These are minaudieres filled with MAC products and you can interchange them with ones you already own. First off I am sucker for minaudieres and have one truly vintage one. 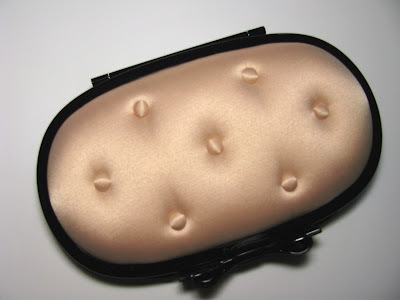 Then there's the idea that you can use your own MAC products in these. LOVE. Fabulousness along with Divine Desire hits online Oct 23 and stores Oct. 25. 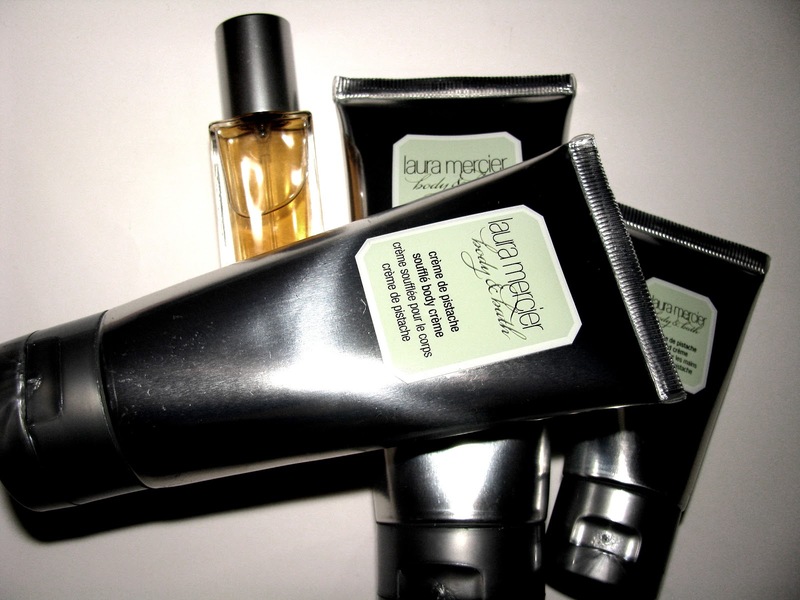 Last year, Laura Mercier's Body Souffle set was one of my favorite gift ideas. Who doesn't love a good body cream ? And one that smells amazing is usually even better. 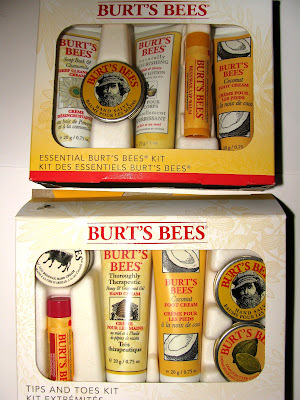 Those I gifted with these loved them. This year there are some new sets featuring these same great scents, the La Petite Patisserie Quartet which comes with 4 different body products all in one scent. Body Souffle, Hand Cream, Fragrance Spray, and Body Wash. All are deeply moisturizing , minus the EDT of course. Shown is Creme di Pistache which is pretty amazing smelling and my favorite of the Mercier scents. Think the best pistachio ice cream or cake you've had. The gift set also comes in Almond Coconut Milk . This set is one of those gifts that's perfect for almost anyone -Grandma, sister, teacher. 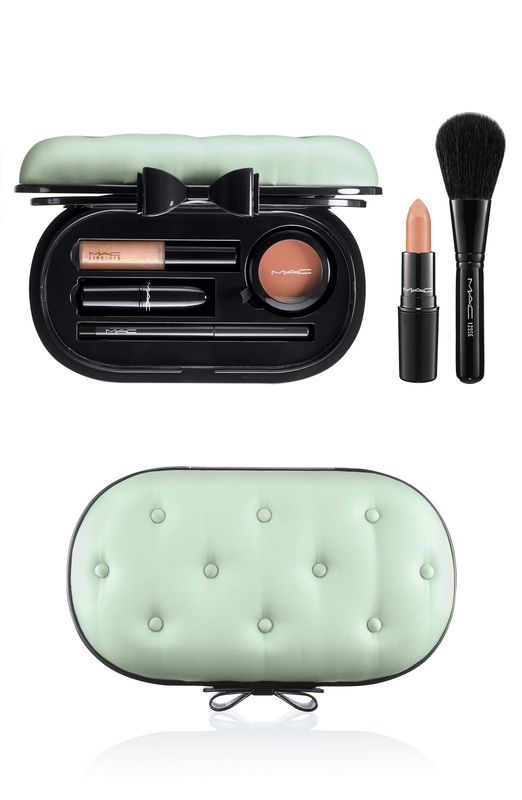 La Petite Patisserie Quartet is $ 50 at www.lauramercier.com , Sephora and department stores where Laura Mercier is sold.